These cupcakes are made without any eggs and use oil instead of butter – avocado oil sounds intriguing! The combination of orange juice and dried berries sounds so delicious! They are also made with whole wheat flour so these cupcakes are super healthy – perfect as part of a healthy breakfast! These colourful quinoa breakfast bowls can be enjoyed by people with various dietary needs as the recipe has no gluten, dairy or eggs, is soy free, perfect for vegans, plus it is refined-sugar free so it’s very healthy too. Quinoa is such a versatile ingredient, perfect in savoury as well as sweet dishes and I just know that this recipe is delicious – I especially like the idea of cooking quinoa in coconut milk instead of water! This bread looks and sounds absolutely delicious – it’s dairy free and the mixture of mixed seeds and rice krispies are such a fun and healthy idea too. I can see how this bread would be especially appealing to children – they would love the krispy topping despite the healthy seeds, dreaded by so many children. This is such a delicious sounding pancake recipe I can almost taste it! I love the idea of adding pineapple into the batter and topping the pancakes with more pineapple. Coconut milk is a great choice in this recipe as it’s an ideal ingredient to pair with the pineapple. If coffee is not enough to wake you up in the morning these zesty delicious pancakes will! Thanks to everyone who shared their recipe last week! Whenever possible your recipes will also get stumbled and shared on google+. Your host next week is Kirsty from Hijacked By Twins. 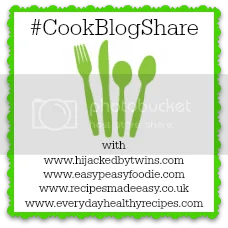 I have linked my post with CookBlogShare that is hosted by Everyday Healthy Recipes. Such lovely and yum yum recipes are posted. Thank you again Monica…. Thanks Monica for featuring my recipe of cup cakes. This week again, I have included a healthy breakfast which is the 3rd blogs anniversary post. Lovely round up Monika. I want to eat them all! That sultana breakfast loaf has my name all over it… for brekkie, lunch, supper! LOL! These are all lovely breakfast ideas. I particularly like the look of the quinoa breakfast bowl and, like you, can’t wait to try cooking quinoa in coconut milk! Great choice Monika. So many good recipes to choose from this week. Have to say I think the coconut and sultana breakfast bread looked particularly good to me. Thanks Jacqui! Yes, I was spoiled for choice, but I had to feature breakfast recipes in the end, they were just so fantastic. Great to hear you will be hosting regularly Monika! Looking forward to seeing and sharing lots more recipes! Loving the breakfast collection and thanks so much for including my breakfast loaf!! ?? Congratulations Monika on becoming a regular host for CookBlogShare 🙂 and great round up too, I’m particularly loving the coconut sultana loaf, and who can resist the vibrant colours of Kate’s breakfast bowl!